It has been one turbulent, traumatic, and life-changing year for Miranda and Alex since the moon was pushed closer to Earth. Miranda is still living in her family's home with her mother and brothers when spring comes, bringing new people and change to their structured life. Her father and his family shows up, with Alex and his sister in tow, and despite all of the disaster around them, Miranda and Alex fall in love. But it seems that everything is working against them--Alex is determined not to be a burden and to take his sister someplace safe, and Miranda's mother is afraid that dwindling supplies might drive their family from their home. And then, when they least expect, a tornado hits, making some choices for the survivors, and forcing them to confront others. This World We Live In is haunting and harrowing, tragic and thoughtful. Told in Miranda's perspective once more, the novel answers a few more questions as life goes on for the survivors of the catastrophic events of the previous year, but is still centrally focused on Miranda's family and their home. They continue to face all sorts of hardships, and continue to be resourceful through their struggles. Miranda's voice is sharp, and her moments of wry, sarcastic humor even out the depressing bits in the book. The book really begins to get interesting when Alex arrives...though he isn't the same person readers left at the end of The Dead and the Gone. Through Miranda's eyes he seems weaker, as if the trauma he has experienced has settled around him, making him a little unreasonable and flat. But, fans of the series will be happy to see the two protagonists finally meet and interact, and will read avidly as they grapple with questions of faith, hope, and love. Some may be disappointed in the lack of chemistry between the two, but it is a relief when they finally become involved romantically. The climax comes quickly, with many high stakes and action sequences, and Miranda's choices and the outcome will leave readers reeling. She ends her diary strongly, with an adamant statement that she will not write any longer, and the result is a very final conclusion that leaves readers without much hope for the future of the characters and plenty of questions. Unless Pfeffer is planning on picking up again in Alex's point of view, she may have many unhappy readers. Cover Comments: I think this is one of the most affecting covers in the series yet. All of the gray is so dismal, and the house looks so skeletal and abandoned. Add the mysterious lighting and the large moon, and this cover is creepy. It speaks very well to the tone of the book, and I like it a lot. Wow, this book sounds fascinating! Your review was really thoughtful and informative. I haven't read the first novels in this series, but they're all definitely going on my reading list now! Thank you for the excellent review! This book is Amazing!!!! It is such a page-turner. I read this one and then the dead and the gone. This series has those types of books that leave you thinking and will stay with you. I thought the ending of this book was awful! It made me regret ever reading the series. I became so invested in the characters to be left wondering what on earth happened to them! I read all three of these books this week - gripping, horrifying and deeply affecting! 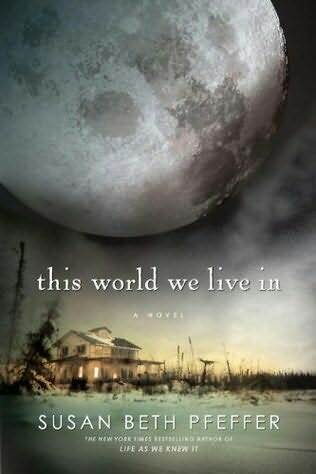 I thought the end of "this world" was terrific - a daring development and very unexpected, but consistent with the lessons learned about life and death in these three fascinating books!